The exploration of gender and power relations and of gender-based violence are one of the core elements of the whole Stepping Stones training package. Stepping Stones seeks to support older and younger men and women to develop mutually respectful ways of being, communicating with, relating to, and supporting one another, across the genders and generations. Its vision is to achieve a more equitable life for everyone in the community, within a rights-based, gendered framework. The Stepping Stones programme has been cited in many different publications highlighting the links between gender relation and HIV and how to address them effectively. 2015: A comprehensive review of curriculum-based HIV and sexuality education programme evaluations was conducted by Nicole Haberland of the Population Council. This found that ‘(A)ddressing gender and power should be considered a key characteristic of effective sexuality and HIV education programs.’ Results indicated that: ‘The programs that addressed gender or power were five times as likely to be effective as those that did not’. Stepping Stones was cited as one of the programmes which does this. 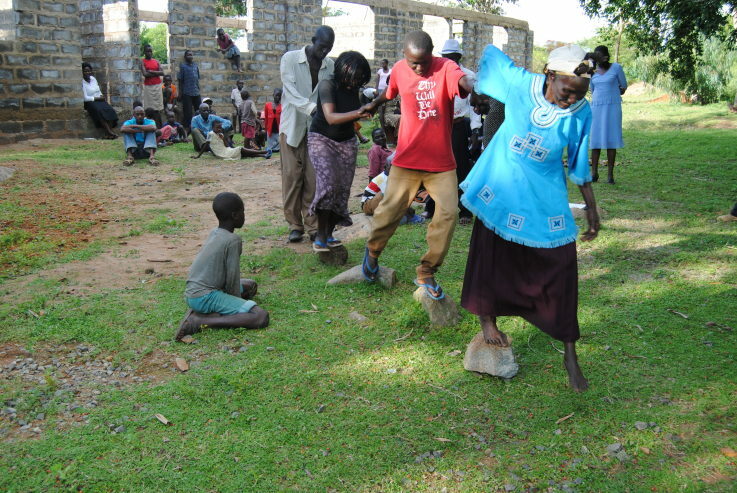 2015: The What Works for Women website includes Stepping Stones as one example of a programme where ‘Community-based participatory learning approaches involving men and women can create more gender-equitable relationships, thereby decreasing violence.‘ Stepping Stones is one of three programmes (together with SASA! and IMAGE) given a Gray II reference. 2013: WHO and UNAIDS: 16 Ideas for Addressing Violence against Women in the Context of the HIV Epidemic. This document describes different evidence-based programmes which have an evidence base. Stepping Stones is highlighted as one of the programmes which can transform cultural and social norms related to gender. 2011: A case study about the use of Stepping Stones by the Coalition of Women living with HIV/AIDS (COWLHA) in Malawi is highlighted in a recent UNAIDS/ATHENA publication. Click here to read in full how the Stepping Stones approach has reduced HIV related stigma for women and girls in communities in Malawi. See also here. Please see also the ‘Working with Men and Boys‘ page. La exploración de las relaciones de género y de poder y de la violencia de género es uno de los elementos centrales de todo el paquete de formación de Stepping Stones. Stepping Stones busca apoyar a hombres y mujeres mayores y jóvenes a desarrollar formas mutuamente respetuosas de ser, comunicarse, relacionarse y apoyarse mutuamente, a través de los géneros y generaciones. Su visión es lograr una vida más equitativa para todos en la comunidad, dentro de un marco de género basado en los derechos. El programa Stepping Stones ha sido citado en muchas publicaciones diferentes, destacando los vínculos entre la relación de género y el VIH y cómo abordarlos eficazmente. Arriba, en inglés, hay algunos de estos recursos. Por favor, consulte también la página “Trabajar con hombres y los niños“. L’exploration des relations de genre et de pouvoir et de la violence basée sur le genre est l’un des éléments centraux de l’ensemble de la formation Parcours. Parcours cherche à aider les hommes et les femmes plus âgés et jeunes à développer des façons d’être mutuellement respectueux, de communiquer avec, de se rapprocher et de se soutenir mutuellement, à travers les genres et les générations. Sa vision est de parvenir à une vie plus équitable pour tous dans la communauté, dans un cadre axé sur les droits et le genre. Le programme Parcours a été cité dans de nombreuses publications différentes mettant en évidence les liens entre la relation de genre et le VIH et la façon de les traiter efficacement.